The Farish Jubilee has stopped working. There doesn't appear to be a connection between the wheels and the copper pickup strips in the tender. I have replaced the chip with a DCC blanking plate and tried it on DC. I have removed the tender from its chassis and checked the pickups. If I give the right hand one a prod, the loco seems to get some power for a second. Does anyone have any experience of this problem? I'll post some more about today, including videos, later, but it would be good to get some assistance, if possible. why couldnt my collage lectures tell it like that,instead of getting us bogged down in those weird sums with lots of letters instead of numbers that must equal zero. There were two disasters today. The first was the Jubilee. I just don’t know what the problem is. However, before I explain the problems, I first decided to make a video of the Jubilee making its way on the DOWN line, including a stop at Marton Hinmarche. 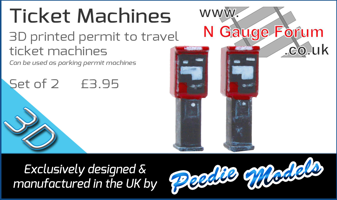 It is first seen as it appears on the mainline from the UP loops. It decelerates and stops, then accelerates away again, finally coming to rest in the DOWN loops. After I made the video, I decided to clean the track with one of the two new Peco track cleaning rubbers that arrived in the post today. 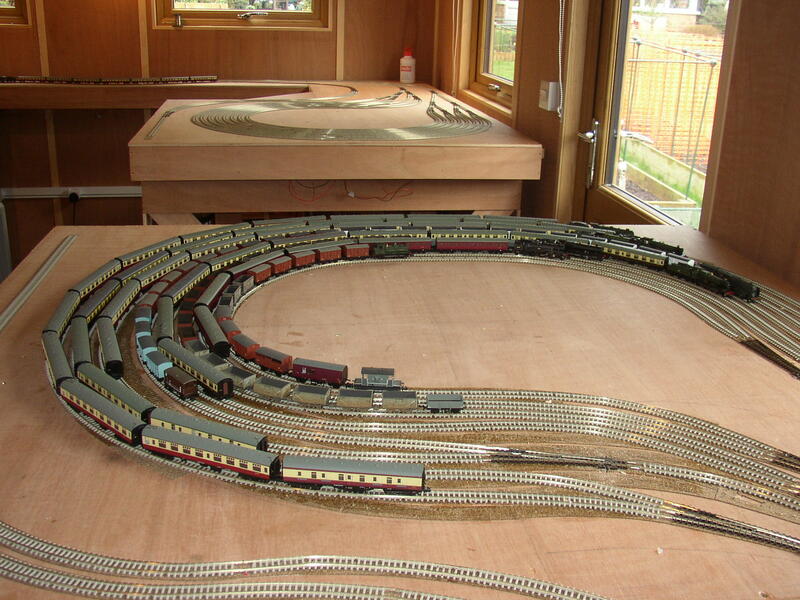 I first moved the Grange to the DOWN loops to leave the UP loops free of any trains. I then cleaned the loops and began testing them. First I ran the 46122, Royal Ulster Rifleman, UP and then at a walking pace right through the whole of the UP loops using Track 1 to ensure that the track was free running with no glitches. I then ran it right round and back to the UP loops to park it in Track 1. The idea was to do this with all the trains in the DOWN loops. Next came the Hall, which once again worked perfectly on Track 2. Then came the Jubilee. Not long after it entered the UP loops at walking pace it stopped, even though it was still on track that had already been tested with the other two locos. I gave it a little push backwards and it ran back for a little. I tried re-burnishing the track and ran it again, with the same results. After a few times, it refused to respond at all. I tried it on the program track, but could not be sure if it was responding. I took out the chip and replaced it with a decoder blanking plug and tried it on DC: nothing. I removed the tender from its chassis and had a look. There was no continuity between the wheels and the copper pickup strips. I prodded each strip in turn and the right hand one seemed to give some response. After a while, it would run a bit on DC, so I refitted the decoder, but there was still no joy. When I tried to read the decoder address, it gave the wrong address, so I reprogrammed the address. But I am still no further forward. It would be good if someone could give me some advice as to what I might do. After that I parked the train (with no loco) in Track 3, and tested the 9F on Track 4. That would have gone without a hitch, but for the fact that its left smoke deflector caught on three of the Jubilees carriages. I will have to alter the spacing of the tracks slightly. After parking the 9F in Track 4, I tested the Grange on Track 5. This was not perfect, but the Grange has always been a bit Graunchy. 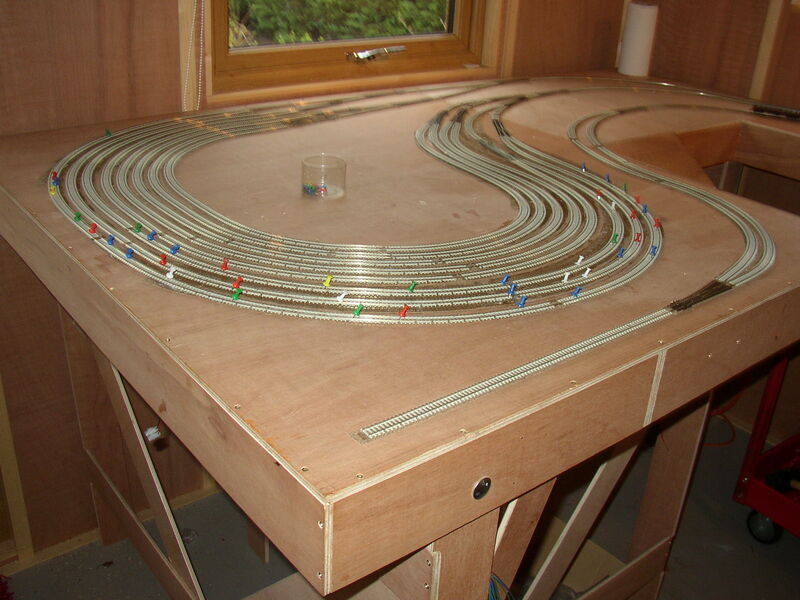 So the second, less extreme, disaster is that, when I have finished testing the cleaned tracks, I will need to readjust the loops slightly, which will probably mean cutting some slightly longer lengths of track for the outside three of four tracks. Fortunately, I have a complete, unopened box of track, so there will be plenty to spare. The Jubilee is dead. Long live the Jubilee! I decided to try and track down the fault by dismantling the loco. That was a mistake. Even with my illuminated monocle, miniature drivers (PH000) and tiny tweezers, it took me over two hours to dismantle and reassemble the loco. The reassembling was the most difficult. In the end the cure was worse than the disease. I contacted Hattons to let them know what I had done and they very generously offered to replace it. So I will post it off tomorrow. I’m afraid there are no pictures today because I spent quite a time in the garden (it was very cold). But I finished my edging and put up most of the pea supports, ready for planting. When I got back to the Train Shed, I finished testing the UP loops and moved everything out of the DOWN loops. Then I was able to clean all the DOWN loops and the main line. I carried out a reverse test but, instead of the Jubilee, I used the B17. In order to do that, I had to move the Jubilee’s train into the goods shed loop. Everything tested fine, apart from the Graunchy Grange. The 2-6-4T is not perfect, but that is not a track problem either. Next up will be the re-jigging of the UP loops to give a little more lateral room for the 9F’s smoke deflectors. 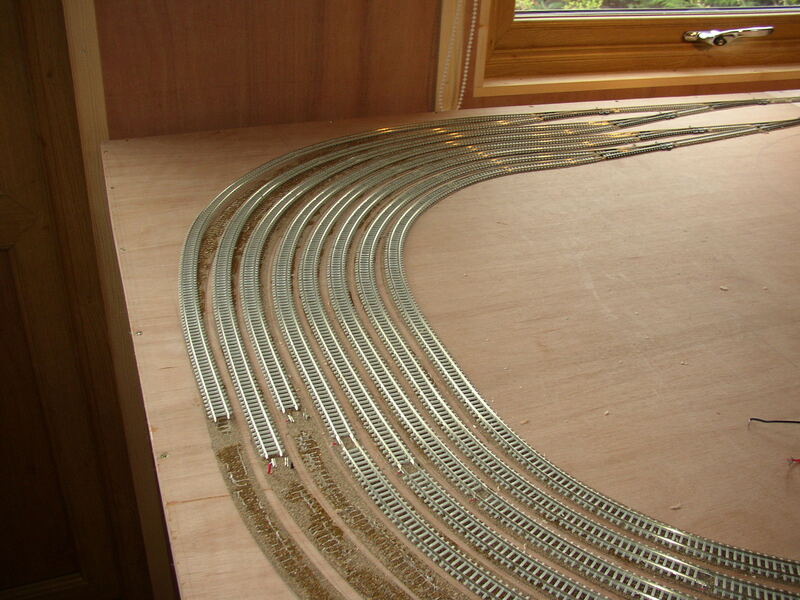 There are also one or two snags that need to be corrected, mostly caused by a small angle between tracks at rail joins. That’s not too much of a problem to correct. Sorry about that Jubilee but nice of Hattons to swap it out. My Grange went back for a refund as it just wouldn't run as it should. Here's hoping you can resolve the other running problems a lot easier. My Grange is still Graunchy, but I hope that a prolonged running period will sort it out. The gardening season is fast approaching, so as the Spring wears on, I will have less time to spend in the Train Shed. However, with the lighter evenings, there may be more time to compensate for the agricultural demands. Today began with a trip to the Post Office to send of the Jubilee. That was after I had been to the Train Shed and ripped up some of the UP loops. Here’s a picture of them before I started. The two problem areas for the 9F smoke deflectors are the curve at the upper left and the large curve nearest the camera. The 9F occupies Track 4 so I need to move Track 3 further away from it. That means I will also have to move Tracks 1 and 2. 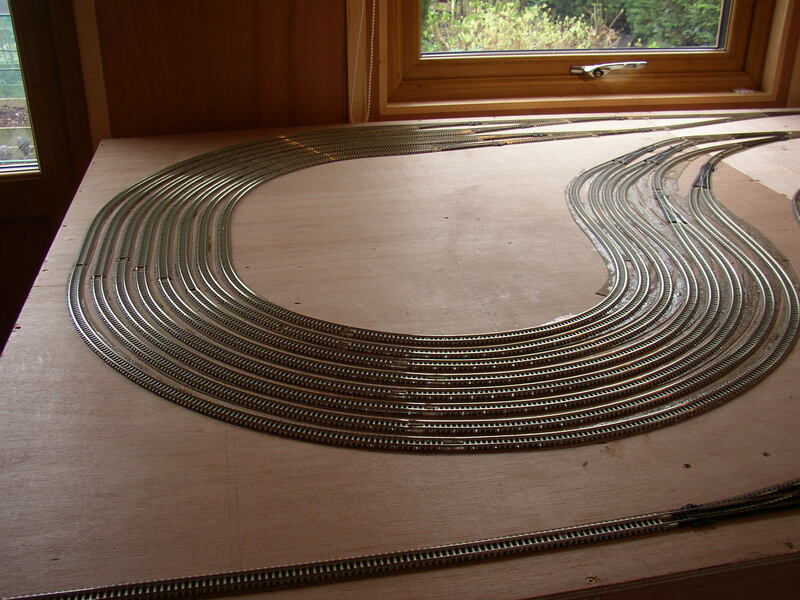 Here’s a picture of the exit curve after the track had been removed, showing where it needs to go when I relay it. And here’s one of the main curve. I hope to be able to complete the work later today. Well, after all the gardening this morning, we went out after lunch and then I managed to get back in the Train Shed and install the realigned loops. I needed two new lengths of track and I had to move all three sets of power droppers. But, after a lot of cutting, filing, sticking and pinning I finally managed to get it all done, including reconnecting the droppers and testing them with my multi-meter. Here’s a picture of the completed result. Tomorrow, I will remove the pins and retest the loops to ensure that there is plenty of room for all the trains to fit on the UP loops. Even with my illuminated monocle, miniature drivers (PH000) and tiny tweezers, it took me over two hours to dismantle and reassemble the loco. I'm very glad that you're relaying those loop lines, Laurence, to avoid side-to-side collisions. A good 'gauging' vehicle is a Dapol autocoach because of the steps on one side with an outside frame Class 08 diesel shunter then a pencil to mark the required 'envelope'. Thanks for the advice Chris. Everything would have been OK but for the fact that the 9F is very long and the smoke deflectors project forward a long way. I'll report back tomorrow on the test results. There were lots of test runs today. 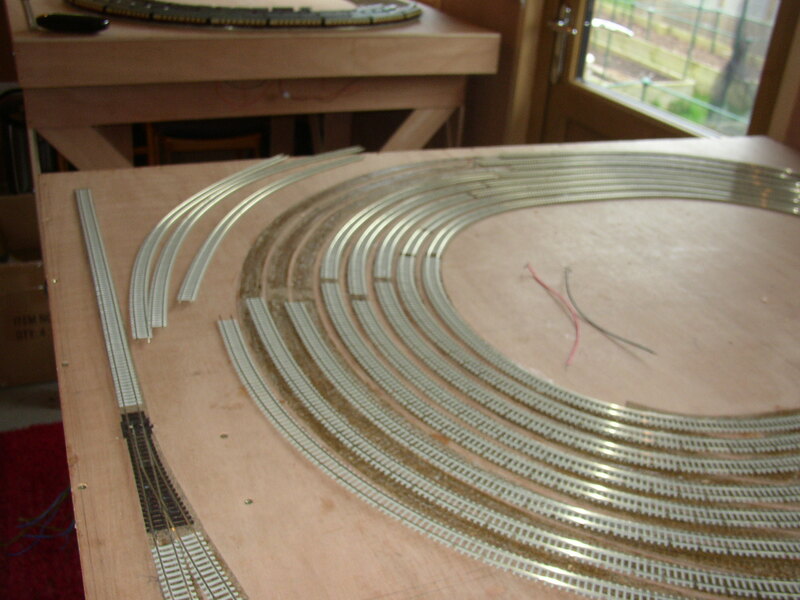 First I removed all the pins from the realignment and started to move the trains one by one from the DOWN loops to the UP loops. I thought I would make a video of the B17 and the 9F transferring to the UP loops. It starts off accelerating out of Track 13 reaching full speed by the time it emerges onto the main line. I’m afraid I didn’t get good light for the start, but I hope you can see it OK. It slows down and stops in the station before pulling away again, to finally slow down and stop safely in the UP loops. Unfortunately, my attempt at filming the 9F was interrupted by finger trouble, so I actually recorded about one second. I’ll try again tomorrow. Here are all the trains safely parked in the UP loops with the DOWN loops in the distance. Then I began to test each train in turn on all the DOWN loops that it would use. The 2-6-4T turned out to be a pain. Each time it stopped, I burnished the top surface of the tack, but it didn’t make any difference. This is despite the fact that other locos ran over the same section without issue. I decided that the loco must be picking up from the flanges and turned my track cleaning rubber on end and cleaned the inside of the rails. I can’t say that this was 100% successful, but it did make a huge difference. So far, I have identified one joint where the 38XX jumps a bit, but without causing a derailment or stop. I intend to adjust this joint tomorrow and retest. Next up will be the 9F, which might cause one or two adjustments. I have decided that, at some time in the future (perhaps a long way in the future) I will relay the hidden storage loops based on the experience of my first attempt. If and when I get round to it, I will allow an extra 5mm between the tracks (30mm instead of the normal double track separation of 25mm) to give plenty of space for carriage overhangs, protruding smoke deflectors, etc. I will also replace many of the medium radius points with curved points to allow the loops to expand without affecting the main line access and egress. However, for now I will just get on with the plan. Once the current round of track tests is complete, I will need to complete the calibration of locomotives and then it’s on to the scenery. The first task will be the platforms (quite important for a railway), then the Metcalf card kits followed by general scenery. Will I be finished this time next year? I very much doubt it.